The controversy regarding the political status of Taiwan, sometimes referred to as the Taiwan Issue or Taiwan Strait Issue, or from a Taiwanese perspective as the Mainland Issue, is a result of the Chinese Civil War and the subsequent split of China into the two present-day self-governing entities of the People's Republic of China (PRC; commonly known as "China") and the Republic of China (ROC; commonly known as "Taiwan"). The issue hinges on whether the islands of Taiwan, Penghu, Kinmen, and Matsu should remain the territory of the ROC as an effectively separate self-governing entity; become unified with the PRC under the existing communist government; convert the ROC to a new "Republic of Taiwan"; or unite with the mainland under the ROC government (after the dissolution of the PRC government). This controversy also concerns whether the existence and legal status as a sovereign state (country) of both the ROC and the PRC is legitimate as a matter of international law. Currently, Taiwan, Penghu, Kinmen, Matsu, and some other minor islands effectively make up the jurisdiction of the state with the official name of the Republic of China (ROC) but commonly known as "Taiwan". The ROC, which took control of Taiwan (including Penghu and other nearby islands) in 1945, ruled mainland China and claimed sovereignty over Outer Mongolia (now Mongolia) and Tannu Uriankhai (part of which is present day Tuva, Russia) before losing the Chinese Civil War to the Communist Party of China (CPC) and relocating its government and capital city from Nanjing (formerly spelled as "Nanking") to Taipei as temporary capital in December 1949. The CPC established new government on the mainland as People's Republic of China (PRC) in October 1949. Since the ROC lost its United Nations seat as "China" in 1971 (replaced by the PRC), most sovereign states have switched their diplomatic recognition to the PRC, recognizing the PRC as the representative of all China, though the majority of countries avoid clarifying what territories are meant by "China" in order to associate with both the PRC and ROC. As of 21 August 2018, the ROC maintains official diplomatic relations with 16 UN member states and the Holy See, although informal relations are maintained with nearly all others. Agencies of foreign governments such as the American Institute in Taiwan operate as de facto embassies of their home countries in Taiwan, and Taiwan operates similar de facto embassies and consulates in most countries under such names as "Taipei Representative Office" (TRO) or "Taipei Economic and Cultural (Representative) Office" (TECO). In certain contexts, Taiwan is also referred to as Chinese Taipei. In addition, the situation can be confusing because of the different parties and the effort by many groups to deal with the controversy through a policy of deliberate ambiguity. The political solution that is accepted by many of the current groups is the perspective of the status quo: to unofficially treat Taiwan as a state and at a minimum, to officially declare no support for the government of this state making a formal declaration of independence. What a formal declaration of independence would consist of is not clear and can be confusing given the fact that the People's Republic of China has never controlled Taiwan and the Republic of China still exists, albeit on a decreased scale. The status quo is accepted in large part because it does not define the legal or future status of Taiwan, leaving each group to interpret the situation in a way that is politically acceptable to its members. At the same time, a policy of status quo has been criticized as being dangerous precisely because different sides have different interpretations of what the status quo is, leading to the possibility of war through brinkmanship or miscalculation. Taiwan (excluding Penghu) was first populated by Austronesian people and was colonized by the Dutch, who had arrived in 1623. The Kingdom of Tungning, lasting from 1661 to 1683, was the first Han Chinese government to rule Taiwan. From 1683, the Qing Dynasty ruled Taiwan as a prefecture and in 1875 divided the island into two prefectures. In 1885 the island was made into a separate Chinese province to speed up development in this region. In the aftermath of the First Sino-Japanese War, Taiwan and Penghu were ceded by the Qing Dynasty to Japan in 1895. Japanese troops in Taiwan surrendered to the Republic of China at end of World War II, putting Taiwan under a Chinese government again after 50 years of Japanese rule. The ROC would then claim sovereignty on the basis of the Qing dynasty's administration, Cairo Declaration, Potsdam Declaration, and Japanese Instrument of Surrender, but this became contested by pro-independence groups in subsequent years due to different perceptions of the said documents' legality. Upon losing the Chinese civil war in 1949, the ROC government retreated to Taipei, and kept control over a few islands along the coast of mainland China and in the South China Sea. The People's Republic of China (PRC) was established in mainland China on 1 October 1949, claiming to be the successor to the ROC. Quemoy, Matsu and Wuchiu on the coast of Fukien, Taiping and Pratas in the South China Sea, are part of the ROC's present territory, but were not ceded to Japan. Some arguments supporting the independence of Taiwan do not apply to these islands. According to the Treaty of Shimonoseki Taiwan was part of Japan at the establishment of the ROC in 1912. The PRC (founded 1 October 1949) argues that the Treaty of Shimonoseki was never valid, saying it was one of several unequal treaties forced upon the Qing. China, during the Qing Dynasty, ceded the island of Taiwan, including Penghu, to Japan "in perpetuity" at the end of the First Sino-Japanese War by signing the Treaty of Shimonoseki. In the Cairo Conference of 1943, the allied powers agreed to have Japan restore "all the territories Japan has stolen from the Chinese", specifically listing "Formosa" and Penghu, to the Republic of China after the defeat of Japan. According to both the People's Republic of China and the Republic of China, this agreement was given legal force by the Instrument of Surrender of Japan in 1945. The PRC's UN Ambassador, Wang Yingfan, has stated multiple times in the UN general committee: "Taiwan is an inseparable part of China's territory since antiquity" and "both the 1943 Cairo Declaration and the 1945 Potsdam Declaration have reaffirmed in unequivocal terms China's sovereignty over Taiwan as a matter of international law." The PRC rejects arguments involving the lack of a specific treaty (San Francisco Peace Treaty) transferring Taiwan's sovereignty to China by noting that neither PRC nor ROC was a signatory to any such treaty, making the treaties irrelevant with regard to Chinese claims. But the US and UK governments hold that the Cairo Declaration made in 1943 is just a war-time statement of intention and cannot itself transfer the sovereignty of Taiwan from Japan to China. The ROC argues that the Treaty of Taipei implicitly transferred sovereignty of Taiwan to it, however the US State Dept. disagreed with such an interpretation in its 1971 Starr Memorandum. On the other hand, a number of supporters of Taiwan independence argue that Taiwan was only formally incorporated as a Chinese territory under the Qing Dynasty in 1683, and as a province in 1885. Subsequently, because of the Shimonoseki Treaty of 1895, Taiwan had been de jure part of Japan when the ROC was established in 1912 and thus was not part of the Chinese republic. Also, because the Cairo Declaration was an unsigned press communiqué, the independence advocates argue that the legal effectiveness of the Declaration is highly questionable. Furthermore, they point out that the Instrument of Surrender of Japan was no more than an armistice, a "modus vivendi" in nature, which served as a temporary or provisional agreement that would be replaced with a peace treaty. Therefore, only a military occupation of Taiwan began on 25 October 1945, and both the Treaty of San Francisco and Treaty of Taipei hold legal supremacy over the surrender instrument. These treaties did not transfer the title of Taiwan from Japan to China. According to this argument, the sovereignty of Taiwan was returned to the people of Taiwan when Japan renounced sovereignty of Taiwan in the Treaty of San Francisco (also known as San Francisco Peace Treaty, SFPT) in 1951, based on the policy of self-determination which has been applied to "territories which detached from enemy states as a result of the Second World War" as defined by article 76b and 77b of the United Nations Charter and also by the protocol of the Yalta Conference. The United Nations General Assembly has not been particularly receptive to this argument, and the ROC's applications for admission to the United Nations have been rejected 15 times. Although the interpretation of the peace treaties was used to challenge the legitimacy of the ROC on Taiwan before the 1990s, the introduction of popular elections in Taiwan has compromised this position. Except for the most extreme Taiwan independence supporters, most Taiwanese support the popular sovereignty theory and no longer see much conflict between this theory of sovereignty and the ROC position. In this sense, the ROC government currently administering Taiwan is not the same ROC which accepted Japanese surrender because the ruling authorities were given popular mandate by different pools of constituencies: one is the mainland Chinese electorate, the other is the Taiwanese constituencies. In fact, former president Chen Shui-bian has been frequently emphasizing the popular sovereignty theory in his speeches. However, as of 2010, the conflict between these two theories still plays a role in internal Taiwanese politics. The popular sovereignty theory, which the pan-green coalition emphasizes, suggests that Taiwan could make fundamental constitutional changes by means of a popular referendum. The ROC legal theory, which is supported by the pan-blue coalition, suggests that any fundamental constitutional changes would require that the amendment procedure of the ROC constitution be followed. From 2008, under the Ma Ying-Jeou administration, Taiwan has had an accommodating policy towards a One China Policy, with the Taipei Times quoting that Ma believes his administration is part of China. 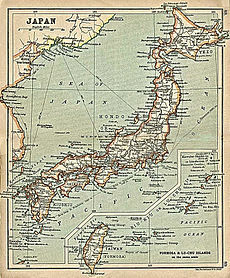 A ROC Map, printed in 1926, which showed Taiwan as part of Japan. Taiwan (Formosa) including the Pescadores were permanently ceded by Qing Dynasty China to Imperial Japan via Articles 2b and 2c of the Treaty of Shimonoseki in 8 May 1895 in one of what the Chinese term as an unequal treaty. Kinmen and Matsu Islands on the coast of Fukien, and the islands in the South China Sea currently administered by the Republic of China on Taiwan were not part of the cession. In 1895, subsequent to the Treaty of Shimonoseki, officials in Taiwan declared independence in the hope of returning the island to Qing rule. The Republic of Taiwan (1895) collapsed after 12 days due to political infighting, but local leaders continued resistance in the hope of achieving self-rule. The incoming Japanese crushed the island's independence bid in a five-month campaign. 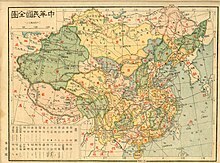 The Chinese Qing Dynasty was subsequently overthrown and replaced by the Republic of China (ROC). Upon the outbreak of the Second Sino-Japanese War, the ROC declared the Treaty of Shimonoseki void in its declaration of war on Japan. The war soon merged with World War II, and Japan was subsequently defeated in 1945 by the Allied Powers, of which the ROC was a part. The United States entered the War in December 1941. Most military attacks against Japanese installations and Japanese troops in Taiwan were conducted by United States military forces. At the Cairo Conference, the U.S., United Kingdom, and the ROC agreed that Taiwan was to be restored to the ROC after the war. This agreement was enunciated in the Cairo Declaration and the Potsdam Declaration, which outlined the terms of Japanese surrender, specified that the terms of the Cairo Declaration shall be carried out. When Japan unconditionally surrendered, it accepted in its Instrument of Surrender the terms of the Potsdam Declaration. Japanese troops in Taiwan were directed to surrender to the representatives of the Supreme Allied Commander in the China Theater, Chiang Kai-shek (i.e. the Republic of China military forces) on behalf of the Allies, according to the directions of General Douglas MacArthur, head of the United States Military Government, in General Order No. 1, which was issued 2 September 1945. Chief Executive Chen Yi of Republic of China soon proclaimed "Taiwan Retrocession Day" on 25 October 1945. When the 228 Incident erupted on 28 February 1947, the U.S. Consulate-General in Taipei prepared a report in early March, calling for an immediate intervention in the name of the U.S. or the United Nations. Based on the argument that the Japanese surrender did not formally transfer sovereignty, Taiwan was still legally part of Japan and occupied by the United States (with administrative authority for the occupation delegated to the Chinese Nationalists), and a direct intervention was appropriate for a territory with such status. This proposed intervention, however, was rejected by the U.S. State Department. In a news report on the aftermath of the 228 Incident, some Taiwanese residents were reported to be talking of appealing to the United Nations to put the island under an international mandate, since China's possession of Taiwan had not been formalized by any international treaties by that time and the island was therefore still under belligerent occupation. They later made a demand for a treaty role to be represented at the forthcoming peace conference on Japan, in the hope of requesting a plebiscite to determine the island's political future. 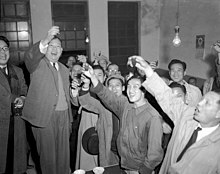 Non-partisan Taiwanese political candidate Wu San-lian (2L) celebrated his landslide victory (65.5%) in the first Taipei city mayoral election in January 1951 with his supporters. 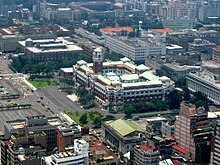 Taipei has been the capital of the Republic of China since December 1949. At the start of 1950, U.S. President Harry S. Truman appeared to accept the idea that sovereignty over Taiwan was already settled when the United States Department of State stated that "In keeping with these [Cairo and Potsdam] declarations, Formosa was surrendered to Generalissimo Chiang-Kai Shek, and for the past 4 years, the United States and Other Allied Powers have accepted the exercise of Chinese authority over the Island." However, after the outbreak of the Korean War, Truman decided to "neutralize" Taiwan claiming that it could otherwise trigger another world war. In June 1950, President Truman, who had previously given only passive support to Chiang Kai-shek and was prepared to see Taiwan fall into the hands of the Chinese Communists, vowed to stop the spread of communism and sent the U.S. Seventh Fleet into the Taiwan Strait to prevent the PRC from attacking Taiwan, but also to prevent the ROC from attacking mainland China. He then declared that "the determination of the future status of Formosa must await the restoration of security in the Pacific, a peace settlement with Japan, or consideration by the United Nations." President Truman later reaffirmed the position "that all questions affecting Formosa be settled by peaceful means as envisaged in the Charter of the United Nations" in his special message to the Congress in July 1950. The PRC denounced his moves as flagrant interference in the internal affairs of China. On 8 September 1950, President Truman ordered John Foster Dulles, then Foreign Policy Advisor to the U.S. Secretary of State, to carry out his decision on "neutralizing" Taiwan in drafting the Treaty of Peace with Japan (San Francisco Peace Treaty) of 1951. According to George H. Kerr's memoir Formosa Betrayed, Dulles devised a plan whereby Japan would first merely renounce its sovereignty over Taiwan without a recipient country to allow the sovereignty over Taiwan to be determined together by the United States, the United Kingdom, Soviet Union, and Republic of China on behalf of other nations on the peace treaty. The question of Taiwan would be taken into the United Nations (which the ROC was still part), if these four parties could not reach into an agreement within one year. When Japan regained sovereignty over itself in 1952 with the conclusion of the Treaty of Peace with Japan (San Francisco Peace Treaty) with 48 nations, Japan renounced all claims and title over Taiwan and the Pescadores. Many claim that Japanese sovereignty only terminated at that point. Notably absent at the peace conference was the ROC which was expelled from mainland China in December 1949 as a result of the Chinese Civil War and had retreated to Taiwan. The PRC, which was proclaimed 1 October 1949, was also not invited. The lack of invitation was probably due to the dispute over which government was the legitimate government of China (which both governments claimed to be); however, Cold War considerations might have played a part as well. Some major governments represented in the San Francisco Conference, such as the UK and Soviet Union, had already established relations with the PRC, while others, such as the U.S. and Japan, still held relations with the ROC. The UK at that time stated for the record that the San Francisco Peace Treaty "itself does not determine the future of these islands," and therefore the UK, along with Australia and New Zealand, was happy to sign the peace treaty. One of the major reasons that the delegate from the Soviet Union gave for not signing the treaty was that: "The draft contains only a reference to the renunciation by Japan of its rights to these territories [Taiwan] but intentionally omits any mention of the further fate of these territories." Article 25 of this treaty officially stipulated that only the Allied Powers defined in the treaty could benefit from this treaty. China was not listed as one of the Allied Powers; however, article 21 still provided limited benefits from Articles 10 and 14(a)2 for China. Japan's cession of Taiwan is unusual in that no recipient of Taiwan was stated as part of Dulles's plan of "neutralizing" Taiwan. The ROC protested its lack of invitation to the San Francisco Peace conference, to no avail. "For the purposes of the present Treaty, nationals of the Republic of China shall be deemed to include all the inhabitants and former inhabitants of Taiwan (Formosa) and Penghu (the Pescadores) and their descendants who are of the Chinese nationality in accordance with the laws and regulations which have been or may hereafter be enforced by the Republic of China in Taiwan (Formosa) and Penghu (the Pescadores)." However, the ROC Minister of Foreign Affairs George Kung-ch'ao Yeh told the Legislative Yuan after signing the treaty that: "The delicate international situation makes it that they [Taiwan and Penghu] do not belong to us. Under present circumstances, Japan has no right to transfer [Taiwan] to us; nor can we accept such a transfer from Japan even if she so wishes." In July 1971 the U.S. State Department's position was, and remains: "As Taiwan and the Pescadores are not covered by any existing international disposition, sovereignty over the area is an unsettled question subject to future international resolution." Mainland Travel Permit for Taiwan Residents. This permit is issued by the People's Republic of China to enable the Taiwan Nationals to travel to mainland China. The People's Republic of China refuses to accept the Republic of China passports. The position of PRC is that the ROC and PRC are two different factions in the Chinese Civil War, which never legally ended. Therefore the PRC claims that both factions belong to the same sovereign country—China. Since, as per the PRC, Taiwan's sovereignty belongs to China, the PRC's government and supporters believe that the secession of Taiwan should be agreed upon by all 1.3 billion Chinese citizens instead of just the 23 million residents of Taiwan. Furthermore, the position of PRC is that UN General Assembly Resolution 2758, which states "Recognizing that the representatives of the Government of the People's Republic of China are the only lawful representatives of China to the United Nations", means that the PRC is recognized as having the sovereignty of all of China, including Taiwan. [note 1] Therefore, the PRC believes that it is within their legal rights to extend its jurisdiction to Taiwan, by military means if at all necessary. In addition, the position of PRC is that the ROC does not meet the fourth criterion of the Montevideo Convention, as it is recognized by only 16 UN member states and has been denied access to international organizations such as the UN. The PRC points out the fact that the Montevideo Convention was only signed by 19 states at the Seventh International Conference of American States. Thus the authority of the United Nations as well as UN Resolutions should supersede the Montevideo Convention. It is clear that the PRC still maintains that "there is only one China in the world" and "Taiwan is an inalienable part of China", however instead of "the Government of the People's Republic of China is the sole legal government of China", the PRC now emphasizes that "both Taiwan and the mainland belong to one and the same China". Although the current position allows for flexibility in terms of defining that "one China", any departure from the One-China policy is deemed unacceptable by the PRC government. The PRC government is unwilling to negotiate with the ROC government under any formulation other than One-China policy, although a more flexible definition of "one China" such as found in the 1992 consensus is possible under PRC policy. The PRC government considers the 1992 consensus a temporary measure to set aside sovereignty disputes and to enable talks. The PRC government considers perceived violations of its "One-China policy" or inconsistencies with it such as supplying the ROC with arms a violation of its rights to territorial integrity. International news organizations often report that "China considers Taiwan a renegade province that must be united with the mainland by force if necessary", even though the PRC does not explicitly say that Taiwan is a "renegade province" in any press releases. However, official PRC media outlets and officials often refer to Taiwan as "China's Taiwan Province" or simply "Taiwan, China", and pressure international organizations to use the term. Republic of China passport issued in 2009. The ROC argues that it maintains all the characteristics of a state and that it was not "replaced" or "succeeded" by the PRC because it has continued to exist long after the PRC's founding. According to the Montevideo Convention of 1933, the most cited source for the definition of statehood, a state must possess a permanent population, a defined territory, a government, and the capacity to enter into relations with other states. Many argue that the ROC meets all these criteria. But to make such an argument, one has to reject the PRC's claim of sovereignty over the territory of the Taiwan island, a claim that has been recognized by most states in the world. Both the original 1912 constitution and the 1923 'Cao' version failed to list Taiwan as a part of the ROC since the framers at the time considered Taiwan to be Japanese territory. It was only in the mid-1930s when both the CCP and KMT realised the future strategic importance of Taiwan that they altered their party positions to make a claim on Taiwan as a part of China. After losing the Civil War against the Communist Party in 1949, Chiang Kai-shek and the Nationalist Party fled to Taiwan, and continued to maintain that their government represented all of China, i.e. both Taiwan and the mainland. The position of most supporters of Taiwan independence is that the PRC is the government of China and that Taiwan is not part of China. Regarding the ROC, some supporters of Taiwan independence claim that the ROC is an independent, sovereign state, and seek to amend the ROC's existing name and constitution and make both something new that suit for an independent Taiwan state. While some other supporters of Taiwan independence regard the ROC as both a military government which has been administering the Taiwan island as a result of post-war military occupation on behalf of the allies of World War II since 1945 and a Chinese refugee regime currently being in-exile on Taiwan since 1949, and they seek to get rid of the ROC and establish an independent Taiwan state. The Democratic Progressive Party states that Taiwan has never been under the jurisdiction of the PRC, and that the PRC does not exercise any hold over the 23 million Taiwanese on the island. On the other hand, the position of most Chinese reunification supporters is that the Chinese Civil War is still not concluded as no peace agreement has ever been signed. Therefore, the current political separation across the Taiwan strait is only temporary and a reunified China including both mainland China and Taiwan will be the result. The position of the Republic of China had been that it was a de jure sovereign state. "Republic of China," according to the ROC government's definition, extended to both mainland China (Including Hong Kong and Macau) and the island of Taiwan. In 1991, President Lee Teng-hui unofficially claimed that the government would no longer challenge the rule of the Communists in mainland China, the ROC government under Kuomintang (KMT) rule actively maintained that it was the sole legitimate government of China. The Courts in Taiwan have never accepted President Lee's statement, primarily due to the reason that the (now defunct) National Assembly never officially changed the acclaimed national borders. Notably, the People's Republic of China claims that changing the national borders would be "a precursor to Taiwan independence". The task of changing the national borders now requires a constitutional amendment passed by the Legislative Yuan and ratified by a majority of all eligible ROC voters, which the PRC has implied would constitute grounds for military attack. 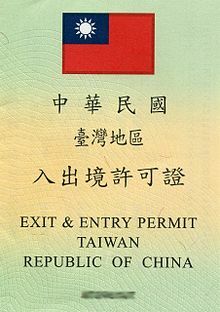 Exit and Entry Permit Taiwan, Republic of China. This permit is issued by the Republic of China to enable residents of mainland China, Hong Kong and Macau to travel to Taiwan. The Republic of China refuses to accept People's Republic of China passports. On the other hand, though the constitution of the Republic of China promulgated in 1946 does not state exactly what territory it includes, the draft of the constitution of 1925 did individually list the provinces of the Republic of China and Taiwan was not among them, since Taiwan was arguably de jure part of Japan as the result of the Treaty of Shimonoseki of 1895. The constitution also stipulated in Article I.4, that "the territory of the ROC is the original territory governed by it; unless authorized by the National Assembly, it cannot be altered." However, in 1946, Sun Fo, son of Sun Yat-Sen and the minister of the Executive Yuan of the ROC, reported to the National Assembly that "there are two types of territory changes: 1. renouncing territory and 2. annexing new territory. The first example would be the independence of Mongolia, and the second example would be the reclamation of Taiwan. Both would be examples of territory changes." Japan renounced all rights to Taiwan in the Treaty of San Francisco in 1951 and the Treaty of Taipei of 1952 without an explicit recipient. While the ROC continuously ruled Taiwan after the government was directed to Taiwan by the General Order No. 1 (1945) to receive Japanese surrender, there has never been a meeting of the ROC National Assembly in making a territory change according to the ROC constitution. The explanatory memorandum to the constitution explained the omission of individually listing the provinces as opposed to the earlier drafts was an act of deliberate ambiguity: as the ROC government does not recognize the validity of the Treaty of Shimonoseki, based on Chiang Kai-shek's Denunciation of the treaty in the late 1930s, hence (according to this argument) the sovereignty of Taiwan was never disposed by China. A ratification by the ROC National Assembly is therefore unnecessary. The Additional Articles of the Constitution of the Republic of China have mentioned "Taiwan Province," and the now defunct National Assembly passed constitutional amendments that give the people of the "Free Area of the Republic of China", comprising the territories under its current jurisdiction, the sole right, until reunification, to exercise the sovereignty of the Republic through elections of the President and the entire Legislature as well as through elections to ratify amendments to the ROC constitution. Also, Chapter I, Article 2 of the ROC constitution states that "The sovereignty of the Republic of China shall reside in the whole body of citizens." This suggests that the constitution implicitly admits that the sovereignty of the ROC is limited to the areas that it controls even if there is no constitutional amendment that explicitly spells out the ROC's borders. The Republic of China Presidential Office Building is located in the Zhongzheng District of Taipei. In 1999, ROC President Lee Teng-hui proposed a two-state theory (兩國論) in which both the Republic of China and the People's Republic of China would acknowledge that they are two separate countries with a special diplomatic, cultural and historic relationship. This however drew an angry reaction from the PRC who believed that Lee was covertly supporting Taiwan independence. President Chen Shui-bian (2000 – May 2008) fully supported the idea that the "Republic of China is an independent, sovereign country" but held the view that the Republic of China is Taiwan and Taiwan does not belong to the People's Republic of China. This is suggested in his Four-stage Theory of the Republic of China. Due to the necessity of avoiding war with the PRC however, President Chen had refrained from formally declaring Taiwan's independence. Government publications have implied that Taiwan refers to the ROC, and "China" refers to the PRC. After becoming chairman of the Democratic Progressive Party in July 2002, Chen appeared to move further than Lee's special two-state theory and in early August 2002, by putting forward the "one country on each side" concept, he stated that Taiwan may "go on its own Taiwanese road" and that "it is clear that the two sides of the straits are separate countries." These statements essentially eliminate any "special" factors in the relations and were strongly criticized by opposition parties in Taiwan. President Chen has repeatedly refused to endorse the One China Principle or the more "flexible" 1992 Consensus the PRC demands as a precursor to negotiations with the PRC. During Chen's presidency, there had not been any successful attempts to restart negotiations on a semi-official level. In the 2008 ROC elections, the people delivered KMT's Ma Ying-jeou with an election win as well as a sizable majority in the legislature. President Ma, throughout his election campaign, maintained that he would accept the 1992 consensus and promote better relations with the PRC. In respect of Taiwan political status, his policy was 1. he would not negotiate with the PRC on the subject of reunification during his term; 2. he would never declare Taiwan independence; and 3. he would not provoke the PRC into attacking Taiwan. He officially accepted the 1992 Consensus in his inauguration speech which resulted in direct semi-official talks with the PRC, and this later led to the commencement of weekend direct charter flights between mainland China and Taiwan. President Ma also interprets the cross-strait relations as "special", "but not that between two nations". He later stated that mainland China is part of the territory of the Republic of China, and laws relating to international relations are not applicable to the relations between mainland China and Taiwan, as they are parts of a state. Voting situation in the UN general assembly respect to resolution 2758 (1971). The PRC refuses to maintain diplomatic relations with any nation that recognizes the ROC, but does not object to nations conducting economic, cultural, and other such exchanges with Taiwan that do not imply diplomatic relation. Therefore, many nations that have diplomatic relations with Beijing maintain quasi-diplomatic offices in Taipei. Similarly, the government in Taiwan maintains quasi-diplomatic offices in most nations under various names, most commonly as the Taipei Economic and Cultural Office. 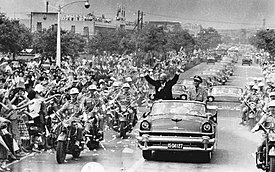 With President Chiang Kai-shek, the U.S. President Dwight D. Eisenhower waved hands to Taiwanese people during his visit to Taipei, Taiwan in June 1960. The United States of America is one of the main allies of Taiwan and, since the Taiwan Relations Act passed in 1979, the United States has sold arms and provided military training to the Republic of China Armed Forces. This situation continues to be a point of contention for China, which considers US involvement disruptive to the stability of the region. In January 2010, the Obama administration announced its intention to sell $6.4 billion worth of military hardware to Taiwan. As a consequence, China threatened the United States with economic sanctions and warned that their cooperation on international and regional issues could suffer. The official position of the United States is that China is expected to "use no force or threat[en] to use force against Taiwan" and that Taiwan is to "exercise prudence in managing all aspects of Cross-Strait relations." Both are to refrain from performing actions or espousing statements "that would unilaterally alter Taiwan's status." The United States maintains the American Institute in Taiwan. The United States, Canada, the United Kingdom, India, Pakistan and Japan have formally adopted the One China policy, under which the People's Republic of China is theoretically the sole legitimate government of China. However, the United States and Japan acknowledge rather than recognize the PRC position that Taiwan is part of China. In the case of Canada and the UK, bilateral written agreements state that the two respective parties take note of Beijing's position but do not use the word support. The UK government position that "the future of Taiwan be decided peacefully by the peoples of both sides of the Strait" has been stated several times. Despite the PRC claim that the United States opposes Taiwanese independence, the United States takes advantage of the subtle difference between "oppose" and "does not support". In fact, a substantial majority of the statements Washington has made says that it "does not support Taiwan independence" instead of saying that it "opposes" independence. Thus, the US currently does not take a position on the political outcome, except for one explicit condition that there be a peaceful resolution to the differences between the two sides of the Taiwan Strait. The United States bi-partisan position is that it doesn't recognize the PRC’s claim over Taiwan, and considers Taiwan’s status as unsettled. All of this ambiguity has resulted in the United States constantly walking on a diplomatic tightrope with regard to cross strait relations. President Chen Shui-bian (far left) attended the funeral of Pope John Paul II in 2005. As the Holy See's recognized head of state of China, Chen was seated in the front row (in French alphabetical order) beside the first lady and president of Brazil. The ROC maintains formal diplomatic relations with 16 UN member states, mostly in Central America, the Caribbean, Africa and Oceania. Additionally, the Holy See also recognizes the ROC, a largely non-Christian/Catholic state, due partly to the Catholic Church's traditional opposition to communism, and also to protest what it sees as the PRC's suppression of the Catholic faith in mainland China. However, Vatican diplomats were engaged in talks with PRC politicians at the time of Pope John Paul II's death, with a view towards improving relations between the two countries. When asked, one Vatican diplomat suggested that relations with Taiwan might prove "expendable" should PRC be willing to engage in positive diplomatic relations with the Holy See. Under Pope Benedict XVI the Vatican and PRC have shown greater interest in establishing ties, including the appointment of pro-Vatican bishops and the Pope canceling a planned visit from the 14th Dalai Lama. During the 1990s, there was a diplomatic tug of war in which the PRC and ROC attempted to outbid each other to obtain the diplomatic support of small nations. This struggle seems to have slowed as a result of the PRC's growing economic power and doubts in Taiwan as to whether this aid was actually in the Republic of China's interest. In March 2004, Dominica switched recognition to the PRC in exchange for a large aid package. However, in late 2004, Vanuatu briefly switched recognition from Beijing to Taipei, followed by a return to its recognition of Beijing. On 20 January 2005, Grenada switched its recognition from Taipei to Beijing, in return for millions in aid (US$1,500 for every Grenadian). However, on 14 May 2005, Nauru announced the restoration of formal diplomatic relations with Taipei after a three-year hiatus, during which it briefly recognized the People's Republic of China. On 26 October 2005, Senegal broke off relations with the Republic of China and established diplomatic contacts with Beijing. The following year, on 5 August 2006, Taipei ended relations with Chad when Chad established relations with Beijing. On 26 April 2007, however, Saint Lucia, which had previously severed ties with the Republic of China following a change of government in December 1996, announced the restoration of formal diplomatic relations with Taipei. On 7 June 2007, Costa Rica broke off diplomatic ties with the Republic of China in favour of the People's Republic of China. In January 2008 Malawi's foreign minister reported Malawi decided to cut diplomatic recognition of the Republic of China and recognize the People's Republic of China. The latest country to break off formal diplomatic relations with Taiwan was El Salvador on 21 August 2018. On 4 November 2013, the Government of Gambia announced its break up with Taiwan, but the Foreign Affairs Ministry of China denied any ties with this political movement, adding that they weren't considering on building a relation with this African nation. Under continuing pressure from the PRC to bar any representation of the ROC that may imply statehood, international organizations have adopted different policies toward the issue of ROC's participation. In cases where almost all UN members or sovereign states participate, such as the World Health Organization, the ROC has been completely shut out, while in others, such as the World Trade Organization (WTO) and International Olympic Committee (IOC) the ROC participates under unusual names: "Chinese Taipei" in the case of APEC and the IOC, and the "Separate Customs Territory of Taiwan, Penghu, Kimmen and Matsu" (often shortened as "Chinese Taipei") in the case of the WTO. The issue of ROC's name came under scrutiny during the 2006 World Baseball Classic. The organizers of the 16-team tournament intended to call Taiwan as such, but reverted to "Chinese Taipei" under pressure from PRC. The ROC protested the decision, claiming that the WBC is not an IOC event, but did not prevail. The ISO 3166 directory of names of countries and territories registers Taiwan (TW) separately from and in addition to the People's Republic of China (CN), but lists Taiwan as "Taiwan, Province of China" based on the name used by the UN under PRC pressure. In ISO 3166-2:CN, Taiwan is also coded CN-71 under China, thus making Taiwan part of China in ISO 3166-1 and ISO 3166-2 categories. Naming issues surrounding Taiwan/ROC continue to be a contentious issue in non-governmental organizations such as the Lions Club, which faced considerable controversy naming its Taiwanese branch. Today, the ROC is the de facto government of Taiwan; whereas the PRC is the de facto government over Mainland China. However, each government claims to be the legitimate government of all China de jure. The arguments below are frequently used by proponents and/or opponents of these claims. The ROC and PRC both officially support the One China policy and thus share common arguments. In the arguments below, "Chinese" is an ambiguous term that could mean the PRC and/or ROC as legal government(s) of China. The waging of aggressive war by Japan against China in 1937 and beyond violates the peace that was brokered in the Treaty of Shimonoseki. In 1941, with the declaration of war against Japan, the Chinese government declared this treaty void ab initio (never happened in the first place). Therefore, some argue that, with no valid transfer of sovereignty taking place, the sovereignty of Taiwan naturally belongs to China. The Cairo Declaration of 1 December 1943 was accepted by Japan in its surrender. This document states that Taiwan was to be restored to the Republic of China at the end of World War II. Likewise, the Potsdam Declaration of 26 July 1945, also accepted by Japan, implies that it will no longer have sovereignty over Taiwan by stating that "Japanese sovereignty shall be limited to the islands of Honshu, Hokkaido, Kyushu, Shikoku and such minor islands". The proclamation of Taiwan Retrocession Day on 25 October 1945, by the ROC (when the PRC had not yet been founded) was entirely uncontested. Had another party been sovereign over Taiwan, that party would have had a period of years in which to protest, and its failure to do so represents cession of rights in the manner of prescription. The lack of protest by any non-Chinese government persists to this day, further strengthening this argument. Even if the SFPT were determinative, it should be interpreted in a manner consistent with the Potsdam and Cairo Declarations, therefore sovereignty would still have been transferred to China. SFPT's validity has come into question as some of the countries participating in the San Francisco conference, such as the USSR, Poland, Czechoslovakia and North and South Korea refused to sign the treaty. Assuming SFPT is valid in determining the sovereignty over Taiwan, Japan, in the article 2 of the SFPT, renounced all rights, without assigning a recipient, regarding Taiwan. Japan in the same article also renounced, without assigning a recipient, areas which are now internationally recognised as territories of Russia as well as other countries. [dubious – discuss] Given that the sovereignty of these countries over renounced areas are undisputed, the Chinese sovereignty over Taiwan must also be undisputed. The ROC fulfills all requirements for a state according to the Convention of Montevideo, which means it has a territory, a people, and a government. The ROC continues to exist since its establishment in 1911, only on a reduced territory after 1949. The creation and continuity of a state is only a factual issue, not a legal question. Declarations and recognition by other states can't have any impact on their existence. According to the declaratory theory of recognition, the recognition of third states are not a requirement for being a state. Most of the cited declarations by American or British politicians are not legal statements but solely political intents. The PRC has never exercised control over Taiwan. The Treaty of Taipei formalized the peace between Japan and the ROC. In it, Japan reaffirmed Cairo Declaration and Potsdam Declaration and voided all treaties conducted between China and Japan (including the Treaty of Shimonoseki). Applying the principle of uti possidetis with regard to the Treaty of Taipei would grant Taiwan's sovereignty to the ROC, as it is undisputed that at the coming into force of the treaty, the ROC controlled Taiwan. Article 4 of the ROC Constitution clearly states that "The territory of the Republic of China" is defined "according to its existing national boundaries..." Taiwan was historically part of China and is therefore naturally included therein. Also, as Treaty of Shimonoseki is void ab initio,[dubious – discuss] China has never legally dispossessed of the sovereignty of the territory. There is, accordingly, no need to have a National Assembly resolution to include the territory. The ROC – USA Mutual Defense Treaty of 1955 states that "the terms "territorial" and "territories" shall mean in respect of the Republic of China, Taiwan and the Pescadores" and thus can be read as implicitly recognizing the ROC sovereignty over Taiwan. [dubious – discuss] However, the treaty was terminated in 1980. In the Joint Communique of the Government of Japan and the Government of the People's Republic of China to the end of Treaty of Taipei, the document signifying the commencement of the PRC and Japan's formal relations, Japan in article 3 stated that it fully understands and respects the position of the Government of the People's Republic of China that Taiwan is an inalienable part of the territory of the People's Republic of China. Japan also firmly maintains its stand under Article 8 of the Potsdam Declaration which says "the terms of the Cairo Declaration shall be carried out". The Cairo Declaration says "All territories Japan has stolen from China, including Manchuria, Taiwan, and the Pescadores, shall be restored to the Republic of China". The PRC argues that it is a successor state of the ROC and is therefore entitled to all of the ROC's holdings and benefits. The peace that was brokered in the Treaty of Shimonoseki was breached by the Boxer Rebellion, which led to the conclusion of the Boxer Protocol of 1901 (Peace Agreement between the Great Powers and China), and China, not by the Second Sino-Japanese War. The Treaty of Shimonoseki was a dispositive treaty, therefore it is not voidable or nullifiable (this doctrine being that treaties specifying particular actions which can be completed, once the action gets completed, cannot be voided or reversed without a new treaty specifically reversing that clause). Hence, the unequal treaty doctrine cannot be applied to this treaty. By way of comparison, as 200,000,000 Kuping taels were not returned to China from Japan, and Korea had not become a Chinese-dependent country again, the cession in the treaty was executed and cannot be nullified. The disposition of Formosa and the Pescadores in this treaty was a legitimate cession by conquest, confirmed by treaty, and thus is not a theft, as described as "all the territories Japan has stolen from the Chinese" in Cairo Declaration. It should also be noted that the Qing court exercised effective sovereignty over primarily the west coast of Taiwan only, and even then did not regard the area as an integral part of national Chinese territory. The "Cairo Declaration" was merely an unsigned press communiqué which does not carry a legal status, while the Potsdam Proclamation and Instrument of Surrender are simply modus vivendi and armistice that function as temporary records and do not bear legally binding power to transfer sovereignty. Good faith of interpretation only takes place at the level of treaties. The "retrocession" proclaimed by ROC in 1945 was legally null and impossible since Taiwan was still de jure part of Japan before the post-war San Francisco Peace Treaty came into effect on 28 April 1952. Consequently, the announcement of the mass-naturalization of native Taiwanese persons as ROC citizens in January 1946 is unjust and void Ab initio. After the San Francisco Peace Treaty came into effect, the sovereignty of Taiwan naturally belonged to the Taiwanese people. Some of Taiwan independence supporters once used arguments not in favor of Chinese sovereignty to dispute to legitimacy of the Kuomintang-controlled government that ruled over Taiwan, they have dropped these arguments due to the democratization of Taiwan. This has allowed the more moderate supporters of independence to stress the popular sovereignty theory in order to accept the legitimacy of the Republic of China (whose government the Democratic Progressive Party used to control) in Taiwan. Former President Chen Shui-bian, by his interpretation of the "Republic of China", has repeatedly confirmed that the "Republic of China is Taiwan." 1) Prescription is the manner of acquiring property by a long, honest, and uninterrupted possession or use during the time required by law. The possession must have been possessio longa, continua, et pacifica, nec sit ligitima interruptio (long, continued, peaceable, and without lawful interruption). For prescription to apply, the state with title to the territory must acquiesce to the action of the other state. Yet, PRC has never established an occupation on Taiwan and exercised sovereignty, 2) Prescription as a rule for acquiring sovereignty itself is not universally accepted. The International Court of Justice ruled that Belgium retained its sovereignty over territories even by non-assertion of its rights and by acquiescence to acts of sovereign control alleged to have been exercised by the Netherlands over a period of 109 years., 3) Also by way of comparison, even after 38 years of continuous control, the international community did not recognize sovereignty rights to the Gaza Strip by Israel, and the Israeli cabinet formally declared an end to military rule there as of 12 September 2005, with a removal of all Israeli settlers and military bases from the Strip, 4) A pro-independence group, which formed a Provisional Government of Formosa in 2000, argued that both the 228 incident of 1947 and the Provisional Government of Formosa have constituted protests against ROC government's claim of retrocession within a reasonable twenty-five year (or more) acquiescence period, 5) Taiwanese residents were unable to make a protest after the 228 incident due to the authoritarian rule under KMT regime which suppressed all pro-independence opinion, 6) Japan was not able to cast a protest as it was under military occupation at the time; however it did not renounce its sovereignty over Taiwan until 28 April 1952. As one of the "territories which detached from enemy states as a result of the Second World War" defined in the articles 76b and 77b of the United Nations Charter, which China signed in 1945 and also defined in the protocol of Yalta Conference, Taiwan qualifies for the UN trusteeship program, and after a period of time would later be considered fully independent. The ROC, as a founding member of the United Nations, has a treaty obligation to comply with the UN Charter and to help the people living in Taiwan enjoy the right of self-determination. The San Francisco Peace Treaty is definitive, where Japan ceded Taiwan (like Sakhalin and Kuril Islands etc.) without specifying a clear recipient. China was prohibited[by whom?] from acquiring Taiwan sovereignty as a benefit when the treaty was finalized[original research?]. Moreover, the Treaty of Taipei only became effective on 5 August 1952, over three months after the coming into force of the San Francisco Peace Treaty on 28 April 1952. Hence, the Treaty of Taipei cannot be interpreted to have ceded the sovereignty of Taiwan to the ROC or the PRC, but only as a recognition of the territories which ROC had and under its control, as Japan cannot cede what it no longer possessed. Since the peace brokered in the Boxer Protocol of 1901 was breached by the second Sino-Japanese War, the San Francisco Peace Treaty specifies that the date to be used in returning territory to China in Article 10 was 1901, not 1895. The postliminium restoration of China was completed without sovereignty over Taiwan since Taiwan was not part of China when the first Chinese Republic was established in 1911. Moreover, the Treaty of Taipei was abrogated by Japan upon the PRC's request in 1972. Cession of Taiwan without a recipient was neither unusual nor unique, since Cuba, as a precedent, was ceded by Spain without recipient in Treaty of Paris of 1898 as the result of Spanish–American War. Cuba reached independence in May 1902. At the end of WWII, Libya and Somaliland were also relinquished without recipient by Italy in the Treaty of peace with Italy of 1947 and both reached independence later. The Nationality Law of the Republic of China was originally promulgated in February 1929. However, no amendment or change to this law or any other law has ever been made by the Legislative Yuan in the post WWII period to reflect any mass-naturalization of native Taiwanese persons as ROC citizens. This is important because Article 10 of the Treaty of Taipei specifies: "For the purposes of the present Treaty, nationals of the Republic of China shall be deemed to include all the inhabitants and former inhabitants of Taiwan (Formosa) and Penghu (the Pescadores) and their descendants who are of the Chinese nationality in accordance with the laws and regulations which have been or may hereafter be enforced by the Republic of China in Taiwan (Formosa) and Penghu (the Pescadores) ... " Since no relevant laws or regulations have ever been promulgated, there is no legal basis to consider native Taiwanese persons as ROC citizens. Nevertheless the popular sovereignty theory does not contradict any arguments in favor of self-determination, nor does it affirm arguments in favor of Chinese sovereignty. This means that at present the only obstacle against declaring Taiwan independence is a lack of consensus among the Taiwanese people to do so; however it is clear that the consensus is changing as the Taiwanese people begin preparations for their 15th application for entrance to the United Nations in the fall of 2007. The Takasago Tribal (Northern) Office of the self-proclaimed Taiwan Civil Government, which claims that Taiwan is under the jurisdiction of the United States, as it displays the United States flag. Some have argued that the United States holds in trust the sovereignty over Taiwan based on the San Francisco Peace Treaty's cession of Taiwan without a recipient. Article 23 of the San Francisco Peace Treaty designated the United States as "the principal occupying power" with respect to the territories covered by the geographical scope of the treaty, including "Formosa and the Pescadores." The argument also states that the Republic of China troops were acting under the directions of the United States when taking over the administration of Taiwan after the completion of the 25 October 1945, Japanese surrender ceremonies. The principal-agent relationship between the United States and the Republic of China was argued to never have been formally terminated. On 24 October 2006, Dr. Roger C. S. Lin led a group of Taiwanese residents, including members of the Taiwan Nation Party, to file a Complaint for Declaratory Relief in the United States District Court for the District of Columbia. According to their lawyer, Mr. Charles Camp, "[t]he Complaint asks the Court to declare whether the Taiwanese plaintiffs, including members of the Taiwan Nation Party, have certain rights under the United States Constitution and other US laws". Their central argument is that, following Japanese renunciation of all rights and claims to Taiwan, Taiwan came under U.S. jurisdiction based on it being the principal occupying power as designated in the Treaty of Peace with Japan and remains so to this day. Moreover, the plaintiffs claimed that the United States has never recognized the incorporation of Taiwan into Chinese national territory. The defendant in this case was the United States government. The District Court agreed with United States government on 18 March 2008 and ruled that the case presents a political question; as such, the court concluded that it had no jurisdiction to hear the matter and dismissed the complaint. This decision was appealed by plaintiffs. The appeals court unanimously upheld the district court ruling and dismissed the appeal. Many political leaders who have maintained some form of One-China Policy have committed slips of the tongue in referring to Taiwan as a country or as the Republic of China. United States presidents Ronald Reagan and George W. Bush have been known to have referred to Taiwan as a country during their terms of office. Although near the end of his term as U.S. Secretary of State, Colin Powell said that Taiwan is not a state, he referred to Taiwan as the Republic of China twice during a testimony to the U.S. Senate Foreign Relations Committee on 9 March 2001. In the People's Republic of China Premier Zhu Rongji's farewell speech to the National People's Congress, Zhu accidentally referred to Mainland China and Taiwan as two countries. There are also those from the PRC who informally refer to Taiwan as a country. South Africa delegates once referred to Taiwan as the "Republic of Taiwan" during Lee Teng-hui's term as President of the ROC. In 2002, Michael Bloomberg, the mayor of New York City, referred to Taiwan as a country. Most recently, former US Secretary of Defense Donald Rumsfeld stated in a local Chinese newspaper in California in July 2005 that Taiwan is "a sovereign nation". The People's Republic of China discovered the statement about three months after it was made. In a controversial speech on 4 February 2006, Japanese Foreign Minister Taro Aso called Taiwan a country with very high education levels because of previous Japanese colonial rule over the island. One month later, he told a Japanese parliamentary committee that "[Taiwan's] democracy is considerably matured and liberal economics is deeply ingrained, so it is a law-abiding country. In various ways, it is a country that shares a sense of values with Japan." At the same time, he admitted that "I know there will be a problem with calling [Taiwan] a country". Later, the Japanese Foreign Ministry tried to downplay or reinterpret his remarks. In February 2007, the Royal Grenada Police Band played the National Anthem of the Republic of China in an inauguration of the reconstructed St George's Queen's Park Stadium funded by the PRC. Grenada had broken off diplomatic relations with Taiwan just two years prior in favor of the PRC. When the Kuomintang visited Mainland China in 2005, the government-controlled PRC media called this event a "visit," and called the KMT one of "Taiwan's political parties" even though the Kuomintang's full name remains the "Chinese Nationalist Party." In mainland China, there is a legal party called the Revolutionary Committee of the Kuomintang that is officially one of the nine "consultative parties," according to the PRC's Chinese People's Political Consultative Conference. On the Foreign Missions page of the Saudi Arabian Ministry of Foreign Affairs for China, the embassy of the People's Republic of China was referred to as the 'Republic of China'. Taiwan was classified as a province of the People's Republic of China in the Apple Maps application in 2013; searches for "Taiwan" were changed automatically to "China Taiwan province" in Simplified Chinese, prompting the Ministry of Foreign Affairs to demand a correction from Apple. Until 1979, both sides intended to resolve the conflict militarily. Intermittent clashes occurred throughout the 1950s and 1960s, with escalations comprising the First and Second Taiwan Strait crises. In 1979, with the U.S. change of diplomatic recognition to the PRC, the ROC lost its ally needed to "recover the mainland." Meanwhile, the PRC's desire to be accepted in the international community led it to promote peaceful unification under what would later be termed "one country, two systems", rather than to "liberate Taiwan" and to make Taiwan a Special Administrative Region. if all possibility of peaceful unification is lost. It has been interpreted that these criteria encompass the scenario of Taiwan developing nuclear weapons (see main article Taiwan and weapons of mass destruction also Timeline of the Republic of China's nuclear program). Much saber-rattling by the PRC has been done over this, with Jiang Zemin, after assuming the mantle of the Chairman of the Central Military Commission, becoming a leading voice. The third condition has especially caused a stir in Taiwan as the term "indefinitely" is open to interpretation. It has also been viewed by some as meaning that preserving the ambiguous status quo is not acceptable to the PRC, although the PRC stated on many occasions that there is no explicit timetable for reunification. Concern over a formal declaration of de jure Taiwan independence is a strong impetus for the military buildup between Taiwan and mainland China. The former US Bush administration publicly declared that given the status quo, it would not aid Taiwan if it were to declare independence unilaterally. The possibility of war, the close geographical proximity of ROC-controlled Taiwan and PRC-controlled mainland China, and the resulting flare-ups that occur every few years, conspire to make this one of the most watched focal points in the Pacific. Both sides have chosen to have a strong naval presence. 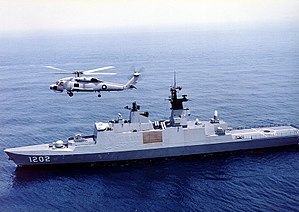 However, naval strategies between both powers greatly shifted in the 1980s and 1990s, while the ROC assumed a more defensive attitude by building and buying frigates and missile destroyers, and the PRC a more aggressive posture by developing long-range cruise missiles and supersonic surface-to-surface missiles. Although the People's Liberation Army Air Force is considered large, most of its fleet consists of older generation J-7 fighters (localized MiG-21s and Mig-21BIs), raising doubts over the PLAAF's ability to control Taiwan's airspace in the event of a conflict. Since mid-1990s PRC has been purchasing, and later localizing, SU-27 based fighters. These Russian fighters, as well as their Chinese J11A variants, are currently over 170 in number, and have increased the effectiveness of PLAAF's Beyond Visual Range (BVR) capabilities. The introduction of 60 new-generation J10A fighters is anticipated to increase the PLAAF's firepower. PRC's acquisition of Russian Su30MKKs further enhanced the PLAAF's air-to-ground support ability. The ROC's air force, on the other hand, relies on Taiwan's fourth generation fighters, consisting of 150 US-built F-16 Fighting Falcons, approximately 60 French-built Mirage 2000-5s, and approximately 130 locally developed IDFs (Indigenous Defense Fighters). All of these ROC fighter jets are able to conduct BVR combat missions with BVR missiles, but the level of technology in mainland Chinese fighters is catching up. Also the United States Defense Intelligence Agency has reported that few of Taiwan's 400 total fighters are operationally capable. In 2003, the ROC purchased four missile destroyers—the former USS Kidd class, and expressed a strong interest in the Arleigh Burke class. But with the growth of the PRC navy and air force, some doubt that the ROC could withstand a determined invasion attempt from mainland China in the future. These concerns have led to a view in certain quarters that Taiwanese independence, if it is to be implemented, should be attempted as early as possible, while the ROC still has the capacity to defend itself in an all-out military conflict. Over the past three decades, estimates of how long the ROC can withstand a full-scale invasion from across the Strait without any outside help have decreased from three months to only six days. Given such estimates, the US Navy has continued practicing "surging" its carrier groups, giving it the experience necessary to respond quickly to an attack on Taiwan. The US also collects data on the PRC's military deployments, through the use of spy satellites, for example. For early surveillance may effectively identify PRC's massive military movement, which may imply PRC's preparation for a military assault against Taiwan. However, numerous reports issued by the PRC, ROC and US militaries make mutually wild contradictory statements about the possible defense of Taiwan. Naturally, war contingencies are not being planned in a vacuum. In 1979, the United States Congress passed the Taiwan Relations Act, a law generally interpreted as mandating U.S. defense of Taiwan in the event of an attack from the Chinese Mainland (the Act is applied to Taiwan and Penghu, but not to Kinmen or Matsu, which are usually considered to be part of Mainland China). The United States maintains the world's largest permanent fleet in the Pacific Region near Taiwan. The Seventh Fleet, operating primarily out of various bases in Japan, is a powerful naval contingent built upon the world's only permanently forward-deployed aircraft carrier USS George Washington. Although the stated purpose of the fleet is not Taiwanese defense, it can be safely assumed from past actions, that is one of the reasons why the fleet is stationed in those waters. Starting in 2000, Japan renewed its defense obligations with the US and embarked on a rearmament program, partly in response to fears that Taiwan might be invaded. Some analysts believed that the PRC could launch preemptive strikes on military bases in Japan to deter US and Japanese forces from coming to the ROC's aid. Japanese strategic planners also see an independent Taiwan as vital, not only because the ROC controls valuable shipping routes, but also because its capture by PRC would make Japan more vulnerable. During World War II, the US invaded the Philippines, but another viable target to enable direct attacks on Japan would have been Taiwan (then known as Formosa). However, critics of the preemptive strike theory assert that the PRC would be loath to give Japan and the US such an excuse to intervene. The United States Department of Defense in a 2011 report stated that the primary mission of the PRC military is a possible military conflict with Taiwan, including also possible US military assistance. Although the risk of a crisis in the short-term is low, in the absence of new political developments, Taiwan will likely dominate future military modernization and planning. However, also other priorities are becoming increasingly prominent and possible due to increasing military resources. Many of mainland China's most advanced military systems are stationed in areas opposite Taiwan. The rapid military modernization is continually changing the military balance of power towards mainland China. A 2008 report by the RAND Corporation analyzing a theoretical 2020 attack by mainland China on Taiwan suggested that the US would likely not be able to defend Taiwan. Cruise missile developments may enable China to partially or completely destroy or make inoperative US aircraft carriers and bases in the Western Pacific. New Chinese radars will likely be able to detect US stealth aircraft and China is acquiring stealthy and more effective aircraft. The reliability of US beyond-visual-range missiles as a mean to achieve air superiority is questionable and largely unproven. In 1996, the PRC began conducting military exercises near Taiwan, and launched several ballistic missiles over the island. The saber-rattling was done in response to the possible re-election of then President Lee Teng-hui. The United States, under President Clinton, sent two aircraft carrier battle groups to the region, reportedly sailing them into the Taiwan Strait. The PRC, unable to track the ships' movements, and probably unwilling to escalate the conflict, quickly backed down. The event had little impact on the outcome of the election, since none of Lee's contestants were strong enough to defeat him, but it is widely believed that the PRC's aggressive acts, far from intimidating the Taiwanese population, gave Lee a boost that pushed his share of votes over 50 percent. The possibility of war in the Taiwan Straits, even though quite low in the short-term, requires the PRC, ROC, and U.S. to remain wary and vigilant. The goal of the three parties at the moment seems to be, for the most part, to maintain the status quo. On 24 October 2006, Dr. Roger C. S. Lin led a group of Taiwanese residents, including members of the Taiwan Nation Party, to file a Complaint for Declaratory Relief in the United States District Court for the District of Columbia. According to their lawyer, Mr. Charles Camp, "the Complaint asks the Court to declare whether the Taiwanese plaintiffs, including members of the Taiwan Nation Party, have certain rights under the United States Constitution and other US laws". Their central argument is that, following Japanese renunciation of all rights and claims to Taiwan, Taiwan came under U.S. jurisdiction based on it being the principal occupying power as designated in the Treaty of Peace with Japan and remains so to this day. This case was opposed by the United States government. The District Court agreed with United States government on 18 March 2008 and ruled that the case presents a political question; as such, the court concluded that it had no jurisdiction to hear the matter and dismissed the complaint. This decision has been appealed by plaintiffs and the appeals court unanimously upheld the district court ruling. The PRC and Taiwan have agreed to increase cooperation in the area of law enforcement. Mainland police will begin staffing a liaison office in Taipei in 2010. Although the situation is complex, most observers believe that it is stable with enough understandings and gentlemen's agreements to keep things from breaking out into open warfare. The current controversy is over the term one China, as the PRC insists that the ROC must recognize this term to begin negotiations. Although the Democratic Progressive Party has moderated its support for Taiwan independence, there is still insufficient support within that party for former President Chen Shui-bian to agree to one China. By contrast, the Kuomintang (KMT) and the People First Party (PFP) appear willing to agree to some variation of one China, and observers believed the position of the PRC was designed to sideline Chen until the 2004 presidential election where it was hoped that someone who was more supportive of Chinese reunification would come to power. Partly to counter this, Chen Shui-bian announced in July 2002 that if the PRC does not respond to Taiwan's goodwill, Taiwan may "go on its own ... road." With Chen's re-election in 2004, Beijing's prospects for a speedier resolution were dampened, though they seemed strengthened again following the Pan-Blue majority in the 2004 legislative elections. However, public opinion in Taiwan reacted unfavorably towards the anti-secession law passed by the PRC in March 2005. Following two high-profile visits by KMT and PFP party leaders to the PRC, the balance of public opinion appears to be ambiguous, with the Pan-Green Coalition gaining a majority in the 2005 National Assembly elections, but the Pan-Blue Coalition scoring a landslide victory in the 2005 municipal elections. Legislative elections were held in Taiwan on January 12, 2008. The results gave the Kuomintang and the Pan-Blue Coalition an absolute majority (86 of the 113 seats) in the legislature, handing a heavy defeat to President Chen Shui-bian's Democratic Progressive Party, which won the remaining 27 seats. The junior partner in the Pan-Green Coalition, the Taiwan Solidarity Union, won no seats. The election for the 12th President of ROC was held on March 22, 2008. Kuomintang candidate Ma Ying-jeou won, with 58% of the vote, ending eight years of Democratic Progressive Party (DPP) leadership. Along with the 2008 legislative election, Ma's landslide victory brought the Kuomintang back to power in Taiwan. This new political situation has led to a decrease of tension between both sides of the Taiwan Strait and the increase of cross-strait relations, making a declaration of independence, or war, something unlikely. Taiwan's Straits Exchange Foundation (SEF) and its Chinese counterpart – the Association for Relations Across the Taiwan Strait (ARATS) signed four agreements in Taipei on 4 November 2008. Both SEF and ARATS have agreed to address direct sea links, daily charter flights, direct postal service and food safety. According to a November 2005 poll from the Mainland Affairs Council, 37.7% of people living in the ROC favor maintaining the status quo until a decision can be made in the future, 18.4% favors maintaining the status quo indefinitely, 14% favors maintaining the status quo until eventual independence, 12% favors maintaining the status quo until eventual reunification, 10.3% favors independence as soon as possible, and 2.1% favors reunification as soon as possible. According to the same poll, 78.3% are opposed to the "One Country, Two Systems" model, which was used for Hong Kong and Macau, while 10.4% is in favor. According to a June 2008 poll from a Taiwanese mainstream media TVBS, 58% of people living in Taiwan favor maintaining the status quo, 19% favors independence, and 8% favors unification. According to the same poll, if status quo is not an option and the ones who were surveyed must choose between "Independence" or "Unification", 65% are in favor of independence while 19% would opt for unification. The same poll also reveals that, in terms of self-identity, when the respondents are not told that a Taiwanese can also be a Chinese, 68% of the respondents identify themselves as "Taiwanese" while 18% would call themselves "Chinese". However, when the respondents are told that duo identity is an option, 45% of the respondents identify themselves as "Taiwanese only", 4% of the respondents call themselves "Chinese only" while 45% of the respondents call themselves "both Taiwanese as well as Chinese". Furthermore, when it comes to preference in which national identity to be used in international organizations, 54% of people in the survey indicated that they prefer "Taiwan" and only 25% of the people voted for "Chinese Taipei". According to an October 2008 poll from the Mainland Affairs Council, on the question of Taiwan's status, 36.17% of respondents favor maintaining the status quo until a decision can be made in the future, 25.53% favors maintaining the status quo indefinitely, 12.49% favors maintaining the status quo until eventual independence, 4.44% favors maintaining the status quo until eventual reunification, 14.80% favors independence as soon as possible, and 1.76% favors reunification as soon as possible. In the same poll, on the question of the PRC government's attitude towards the ROC government, 64.85% of the respondents consider the PRC government hostile or very hostile, 24.89 consider the PRC government friendly or very friendly, while 10.27% did not express an opinion. On the question of the PRC government's attitude towards the people in Taiwan, 45.98% of the respondents consider the PRC government hostile or very hostile, 39.6% consider the PRC government friendly or very friendly, while 14.43% did not express an opinion. May 2009 Taiwan's (Republic of China) Department of the Interior published a survey examining whether people in Taiwan see themselves as Taiwanese, Chinese or both. 64.6% see themselves as Taiwanese, 11.5% as Chinese, 18.1% as both and 5.8% were unsure. According to a December 2009 poll from a Taiwanese mainstream media TVBS, if status quo is not an option and the ones who were surveyed must choose between "Independence" or "Unification", 68% are in favor of independence while 13% would opt for unification. As of March 2012, a poll by the Global Views Monthly indicated that support for Taiwanese independence has risen. According to the survey 28.2 percent of respondents indicated that they support a formal declaration for Taiwan independence, a rise of 3.7 percent compared to a similar poll conducted earlier in 2012. Asked whether Taiwan would eventually declare itself a new and independent nation, 49.1 percent replied yes while 38 percent responded negatively, the Global Views Monthly said. Only 22.9 percent agreed that Taiwan should eventually unify with China, while 63.5 percent disagreed. A June 2013 poll conducted by DPP showed an overwhelming 77.6% consider themselves as Taiwanese. A)On the independence-unification issue, the survey found that 25.9 percent said they support unification, 59 percent support independence and 10.3 percent prefer the "status quo." B)When asked whether Taiwan and China are parts of one country, the party said the survey found 78.4 percent disagree, while 15 percent agreed. C)As for whether Taiwan and China are two districts in one country, 70.6 percent disagree, while 22.8 percent agree, the survey showed. D)When asked which among four descriptions — "one country on each side,” "a special state-to-state relationship," "one country, two areas,” and "two sides are of one country" — they find the most acceptable, 54.9 percent said "one country on each side," 25.3 percent chose "a special state-to-state relationship,” 9.8 percent said "one country, two areas" and 2.5 percent favor "two sides are of one country," the survey showed. From the perspective of the ROC constitution, which the mainstream political parties such as the KMT and DPP currently respect and recognize, changing the ROC's governing status or completely clarifying Taiwan's political status would at best require amending the ROC constitution. In other words, if reunification supporters wanted to reunify Taiwan with mainland China in such a way that would effectively abolish the ROC or affect the ROC's sovereignty, or if independence supporters wanted to abolish the ROC and establish a Republic of Taiwan, they would also need to amend or abolish the ROC constitution and redraft a new constitution. Passing an amendment requires an unusually broad political consensus, which includes approval from three-quarters of a quorum of members of the Legislative Yuan. This quorum requires at least three-quarters of all members of the Legislature. After passing the legislature, the amendments need ratification from at least fifty percent of all eligible voters of the ROC, irrespective of voter turnout. Given these harsh constitutional requirements, neither the pan-greens nor pan-blues can unilaterally change Taiwan's political and legal status with respect to the ROC's constitution. However, extreme Taiwan independence supporters view the ROC's constitution as illegal and therefore believe that amendments to the ROC constitution are an invalid way to change Taiwan's political status. Some scholarly sources as well as political entities like the PRC refer to Taiwan's controversial status as the "Taiwan question", "Taiwan issue", or "Taiwan problem". The ROC government does not like these terminologies, emphasizing that it should be called the "Mainland issue" or "Mainland question", because from the ROC's point of view, the PRC is making an issue out of or creating a problem out of Taiwan. Others use the term "Taiwan Strait Issue" because it implies nothing about sovereignty and because "Cross-Strait relations" is a term used by both the ROC and the PRC to describe their interactions. However, this term is also objectionable to some because it still implies that there is an issue, which they feel is created only by the PRC. The use of the terms de facto and de jure to describe Taiwan's as well as the Republic of China's status as a state is itself a contentious issue. This partially stems from the lack of precedents regarding derecognized, but still constitutionally functioning states. For instance, it is regularly argued[by whom?] that Taiwan satisfies the requirements of statehood at international law as stated in the Montevideo Convention. At the same time, there is continued debate on whether UN membership or recognition as a state by the UN is a decisive feature of statehood (since it represents broad recognition by the international community); the debate arises because non-state entities can often satisfy the Montevideo Convention factors, while the list of states recognised by the UN, for the most part, correlates well with entities recognised as states by customary international law. If the latter argument is accepted, then the Republic of China may have ceased to be a state post-1971 as a matter of international law ("de jure"), yet continued to otherwise function as the state that it previously was recognised as ("de facto"). From the 1990s onwards, media wire services sometimes describe Taiwan as having de facto independence, whereas the Republic of China has always considered itself as a continuously functioning de jure state. ^ Established by Cairo Declaration, Potsdam Proclamation and Japanese Instrument of Surrender, according to the PRC's claim. ^ "Taiwan breaks ties with Malawi". The Hindu. 14 January 2008. Retrieved 2 February 2008. ^ a b Ko, Shu-Ling (8 October 2008). "Ma refers to China as ROC territory in magazine interview". Taipei Times. ^ "The One-China Principle and the Taiwan Issue". Taiwan Affairs Office and the Information Office of the State Council of the People's Republic of China. 21 February 2000. Retrieved 2 August 2008. ^ Starr, Robert I. (13 July 1971), Legal Status of Taiwan, US State Dept., retrieved 26 December 2009 ; reprinted as Appendix C of Tkacik, John J. (ed.). Rethinking One China. Washington, D.C.: Heritage Foundation. ISBN 9780891952701. ^ "UN again rejects Taiwan allies' letter on UN bid". Taipei Representative Office in the UK. Central News Agency. 2008-04-02. Retrieved 30 July 2011. ^ Lowther, William (30 March 2012). "Taiwan 'agrees' it's part of China: ex-US diplomat". The Taipei Times. Retrieved 17 December 2014. ^ Durdin, Tillman (30 March 1947). "FORMOSANS' PLEA FOR RED AID SEEN; Harsh Repression of Revolt Is Expected to Increase Efforts to Escape Rule by China". New York Times. Retrieved 2007-10-06. ^ "Formosans Ask Treaty Role". New York Times. 5 October 1947. Retrieved 2007-10-06. ^ "United States Policy Toward Formosa". Statement by President Truman (Report). Department of State Bulletin. 22. 16 January 1950. ^ Eisenhower, Dwight D. (1963). Mandate for Change 1953-1956. Doubleday & Co., New York. p. 461. OCLC 2551357. Retrieved 2011-07-07. The Japanese peace treaty of 1951 ended Japanese sovereignty over the islands but did not formally cede them to "China," either Communist or Nationalist. ^ a b "The One-China Principle and the Taiwan Issue". PRC Taiwan Affairs Office and the Information Office of the State Council. 2005. Retrieved 6 March 2006. ^ "Four-point guidelines on cross-Straits relations set forth by President Hu". PRC Taiwan Affairs Office and the Information Office of the State Council. Retrieved 16 September 2008. ^ "China expresses strong indignation for "US-Taiwan defense conference": FM spokesman". People's Daily. 10 October 2004. ^ Stephen D. Krasner (2001). Problematic Sovereignty: Contested Rules and Political Possibilities. New York City: Columbia University Press. p. 46. ISBN 0231121792. ^ a b c "The Official Position of the Republic of China (Taiwan) on China's Passing of the Anti-secession (Anti-Separation) Law" (Press release). Mainland Affairs Council, ROC Executive Yuan. 29 March 2005. ^ "Taiwan assembly passes changes". BBC. 7 June 2005. ^ Bunnag, Sanya (20 July 1999). "Understanding Taiwan's tactics". BBC. ^ Willem van Kemenade (2000). "Taiwan, Voting for Trouble?". The Washington Quarterly. 23.2: 135–151. ^ "Beijing media ups the ante". BBC. 20 July 1999. ^ "Taiwan and China in 'special relations': Ma". China Post. 4 September 2008. ^ "馬總統：兩岸關係是現實關係" [President Ma: Cross-strait relations are relations based on current reality] (in Chinese). Central News Agency of the Republic of China. 8 October 2008. ^ 王寓中 (8 October 2008). "馬：大陸是中華民國領土" [Ma: the mainland is the territory of the Republic of China] (in Chinese). Liberty Times. ^ Yates, Stephen J. (16 April 1999). "The Taiwan Relations Act After 20 Years: Keys to Past and Future Success". The Heritage Foundation. Retrieved 19 July 2009. ^ "China: US spat over Taiwan could hit co-operation". Agence France Presse. 2 February 2010. ^ a b "Overview of US Policy Towards Taiwan" (Press release). US Department of State. 21 April 2004. Archived from the original on 13 May 2004. ^ "Fact Sheet". Canadian Trade Office in Taipei. Retrieved 6 October 2014. ^ Shirley A. Kan; Wayne M. Morrison (4 January 2013). "U.S.-Taiwan Relationship: Overview of Policy Issues" (PDF). Congressional Research Service. p. 4. ^ Spencer, Richard (16 May 2005). "Vatican ready to sacrifice Taiwan for China". London: Daily Telegraph. ^ "The Vatican's Cold Shoulder". Wall Street Journal. 20 December 2007. Retrieved 14 January 2008. ^ Painter, James (30 March 2004). "Taiwan's 'Caribbean headache'". BBC. ^ Vurobaravu, Fred (24 November 2004). "Parliament debates Vanuatu-Taiwan deal". Vanuatu Daily Post. ^ "Vanuatu gov. reshuffled after Taiwan controversy". China Radio International. 11 December 2004. ^ "Grenada picks China over Taiwan". BBC. 21 January 2005. ^ Su, Joy (15 May 2005). "Nauru Switches its Allegiance Back to Taiwan from China". Taipei Times. ^ "Senegal picks China over Taiwan". BBC. 26 October 2005. ^ "Taiwan Breaks Off Relations With Chad". Voice of America. 5 August 2006. ^ "Taiwan re-establishes diplomatic relations with St. Lucia". International Herald Tribune. 30 August 2007. ^ "Taiwan loses Costa Rica's support". BBC News. 7 June 2007. Retrieved 7 June 2007. ^ Wu, Debby (14 January 2008). "Malawi Drops Ties With Taiwan for China". The Washington Post. Associated Press. Archived from the original on 7 April 2012. Retrieved 14 January 2008. ^ "Taiwan loses second ally in a month amid China pressure". Channel NewsAsia. Retrieved 2018-12-28. ^ "Gambia breaks relations with surprised Taiwan; China says it wasn't in contact with government". Washington Post. 14 November 2013. ^ Klapper, Bradley (23 May 2006). "Taiwan fails in 10th bid for WHO observer status". Associated Press. ^ Yeh, Lindy (12 July 2002). "Taiwan's Lions Club gets another temporary name". Taipei Times. p. 3. ^ "The True Legal Status of Taiwan". taiwanbasic.com. Taiwan Civil Government. ^ "Tsai blasted for R.O.C. legitimacy remark". China Post. 27 May 2010. Retrieved 12 June 2010. ^ Ko, Shu-ling (29 April 2009). "Treaty confirmed sovereignty: Ma". Taipei Times. Retrieved 14 June 2010. ^ Chiu, H. (1996). "The International Legal Status of Taiwan". In Henckaerts, J. The international status of Taiwan in the new world order: legal and political considerations. Kluwer Law International. pp. 7–8. ISBN 9789041109293. OCLC 38016893. In any case, there appears to be strong legal ground to support the view that since the entry into force of the 1952 ROC-Japan bilateral peace treaty, Taiwan has become the de jure territory of the ROC. This interpretation of the legal status of Taiwan is confirmed by several Japanese court decisions. For instance, in the case of Japan v. Lai Chin Jung, decided by the Tokyo High Court on December 24, 1956, it was stated that ‘Formosa and the Pescadores came to belong to the Republic of China, at any rate on August 5, 1952, when the [Peace] Treaty between Japan and the Republic of China came into force…’...the principles of prescription and occupation that may justify the ROC's claim to Taiwan certainly are not applicable to the PRC because the application of these two principles to the Taiwan situation presupposes the validity of the two peace treaties by which Japan renounce its claim to Taiwan and thus makes the island terra nullius. ^ "US scrambles as Powell learns the art of 'diplospeak'". Agence France-Presse. 15 March 2001. ^ "China and Taiwan 'two countries': Zhu". Taipei Times. 6 March 2003. p. 3. ^ Gluck, Caroline (17 August 2005). "Taiwan struggles with Chinese dissidents". BBC. ^ Su Tseng-chang (3 June 1994). "大聲說出「台灣属於我們中國」". DPP. Archived from the original on 23 February 2006. Retrieved 16 July 2006. ^ "NY mayor stands up for Taiwan". Taipei Times. 2 May 2002. ^ "Good schools due to Japan: Aso". Taipei Times. 6 February 2006. p. 2. ^ "Japan's Aso calls Taiwan a 'country'". Taipei Times. 10 March 2006. p. 1. ^ "Grenada investigates anthem gaffe". BBC News. 4 February 2007. ^ "China". Mofa.gov.sa. Retrieved 6 December 2011. ^ "Bush Opposes Taiwan Independence". Fox News. 9 December 2003. p. 1. ^ Office of the Secretary of Defense (6 May 2011). Military and Security Developments Involving the People's Republic of China, 2011 (PDF). Annual Report to Congress (Report). Retrieved 16 February 2012. ^ Minnick, Wendell (22 February 2010). "U.S. Intel Report on Taiwan Air Power Released". Defensenews.com. Retrieved 6 December 2011. ^ Hebert, Adam J. "Behind the Taiwan Arms Sales". Airforce-magazine.com. Retrieved 6 December 2011. ^ Chang, Rich (1 May 2006). "War simulations reveal communication problem". Taipei Times. p. 3. ^ Dunnigan, James (7 July 2004). "US Navy Sticks it to China". Dirty Little Secrets. StragtegyPage.com. Retrieved 11 June 2006. ^ "Law Offices of Charles H_ Camp News". Retrieved 28 January 2007. ^ "Civil Action No. 2006-1825 LIN et al. v. UNITED STATES OF AMERICA". Retrieved 16 April 2008. ^ "USCA Court case Statement of Facts". Retrieved 1 January 2009. ^ "Roger Lin v. United States of America" (PDF). Retrieved 5 April 2014. ^ "兩岸簽共同打擊犯罪及司法互助協議 將重打經濟犯罪". 中國台灣網. 26 April 2009. Retrieved 20 May 2009. ^ "Taiwan reached deals with China at the expense of sovereignty and democracy". EFTA. 6 November 2008. ^ "民意調查：「民眾對當前兩岸關係之看法」結果摘要". 行政院大陸委員會. Archived from the original on 27 September 2007. Retrieved 18 October 2006. ^ "民意調查：兩會復談前國族認同民調" (PDF). TVBS. Retrieved 20 June 2008. ^ 「大陸政策與兩岸協商」民意調查(民國97年10月10日~10月12日)問卷及百分比分布 (PDF) (in Chinese). Mainland Affairs Council of the Republic of China. Archived from the original (PDF) on 29 October 2008. Retrieved 16 October 2008. ^ 「民眾的政治態度及族群觀點」民意調查 加權百分比摘要表 (PDF) (in Chinese). Taiwan's (Republic of China) Department of the Interior. Retrieved 11 June 2009. ^ "Taiwanese text" (PDF). TVBS. Retrieved 23 December 2009. ^ Lee, Hsin-fang. "DPP poll finds 77.6% identify as Taiwanese". Retrieved 7 July 2013.